In the field of dome color camera the CD6 is really a new sensation with 2.8 -12mm lens and a robust vandal proof appearance. In terms of technology the CD6 goes for the best featuring Sony Super HAD2 700 line, CCD sensor that only provides quality images with vivid colors and zero lux sensitivity. Objects with a distance of 90 feet can be visible with all details even in dark conditions with the help of 41 LED infrared illuminators. 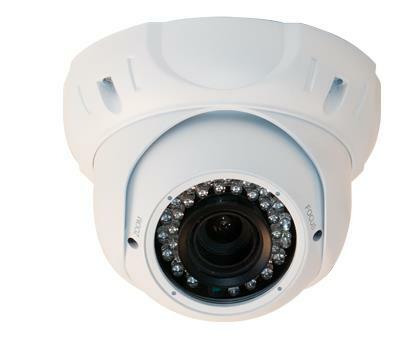 Very often dome camera installation process requires additional time and steps. The CD6 frees you from this monotonous and time consuming task with its EZ mounting design. Lightning, heavy rain, sleet, wind, snow and all sorts of extreme weather conditions can do no harm to this camera because of its IP66 weatherproof rated housing. You can use this device for both home and business applications. Operating Conditions -4º to 122ºF (-20º to 50ºC) 90% RH Max. Storage Conditions -4º to 140ºF (-20º to 60ºC) 90% RH Max. Weight 1.85 lb (0.8 kg) approx.